A Maryland State Police employee struck a state police trooper along southbound Interstate 95 in Jessup Wednesday afternoon, closing all southbound lanes in the area for several hours, according to police. About 3 p.m., Trooper First Class Wing Tong of the Waterloo Barrack stopped a Ford SUV near Route 175 for appearing to have improper license plates, according to police. As Tong approached the stopped Ford on its passenger side, a Mercury drove on to the soldier and struck Tong's car and the Ford, which knocked tong over the guardrail. Tong was flown to the University of Maryland Shock Trauma Center in Baltimore in critical condition. He is now in stable condition. The driver of the Mercury, 65-year-old Maureen Walter of Poolesville, was taken to Howard County General Hospital. She is a state police civilian employee and was driving a car registered to the department. 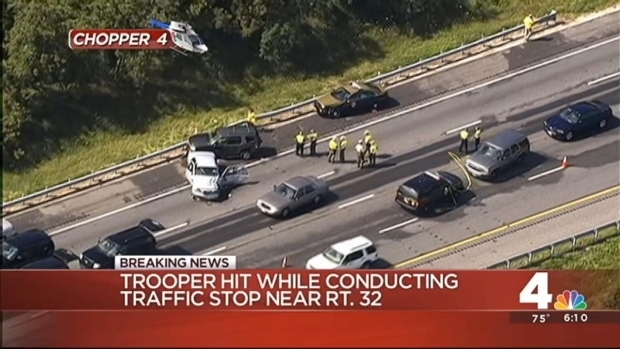 News4's Shomari Stone reports that road closures are estimated to last through rush hour after a trooper was hit while conducting a traffic stop Wednesday afternoon. The trooper was evacuated and his condition is unknown. The driver of the Ford, 35-year-old Fabino de Aguiar of Silver Spring, also was taken to Howard County General. Tong's emergency lights were activated at the time of the collision, police said. Southbound I-95 remained closed through rush hour. Tong has been on the force since 2012.